Leadership is big business. There are countless books, seminars, tweets and yes, blogs. In the course of my business day I often get emails related to the latest leadership book or upcoming seminar. A few days ago I had to laugh when I received an email invite to a “Leadership Summit”. I scanned the information to see what jumped out at me. Beyond the great location, something did indeed jump off the page. In this multi-day summit meeting there are two separate tracks. Participants need to sign up for one or the other. The two choices are: (1) The Extraordinary Leader Workshop or (2) The Inspiring Leader Workshop. How would one choose? What would I choose? What would you choose? The website does not give more information to help me select one track over another. 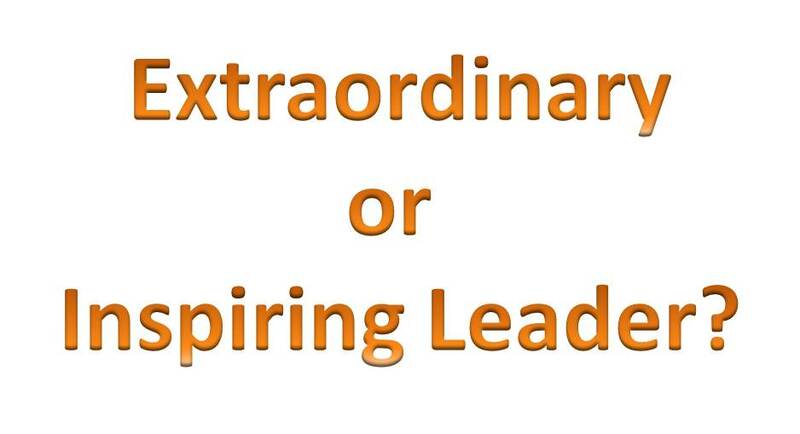 Do I want to be extraordinary or inspiring? The forced choice amuses me. If I attended the extraordinary track I would wonder what is happening in the inspiring group next door. You know they would be loud and obviously having a good time. Of course the seminar … oops, summit is the 4th annual. So I can choose extraordinary this year and hey, inspiring next year. But wait, I see a third option, Advancing the Extraordinary Leader. Well, inspiring may need to wait yet another year. A little tongue in cheek today. Growth, development, and learning are part of the leader’s journey. Do walk your path, be extraordinary, and be inspiring. Attend seminars … okay, summits at your own risk. Yes Indeed. Especially these days, extraordinary and inspiring leadership.